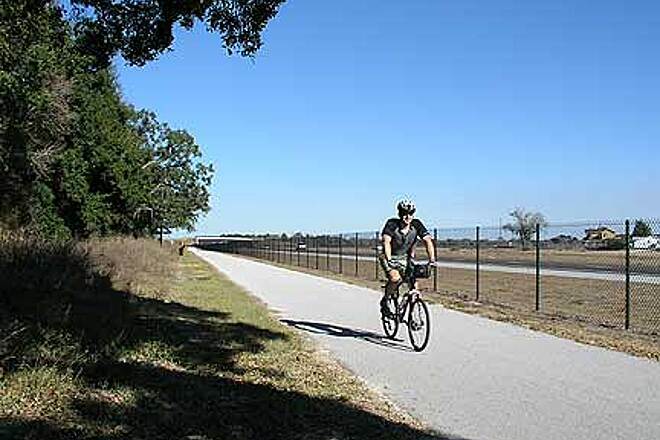 Opened in 2001, the Suncoast Trail is part of Florida's Statewide Greenways and Trails System. 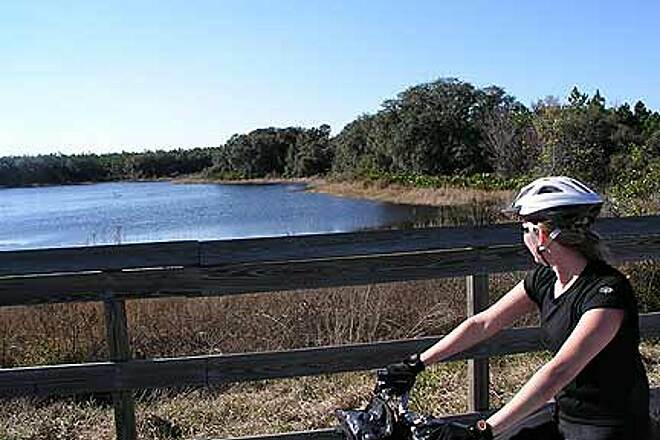 The trail parallels the Suncoast Parkway, beginning in northern Hillsborough County, and heads north through Pasco and Hernando counties. It passes through a mix of suburban, agricultural and natural areas, along which you will find rest areas and interpretive signs that illuminate the trail's historical significance and identify the local ecology. Trailhead at Lutz Lake Fern Road (southern terminus): From Tampa, take Dale Mabry Highway (CR 597) north to Lutz Lake Fern Road. 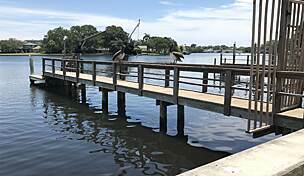 Turn left (west) and continue for about 3 miles until you pass under the Suncoast Parkway. Trailhead is on the right. 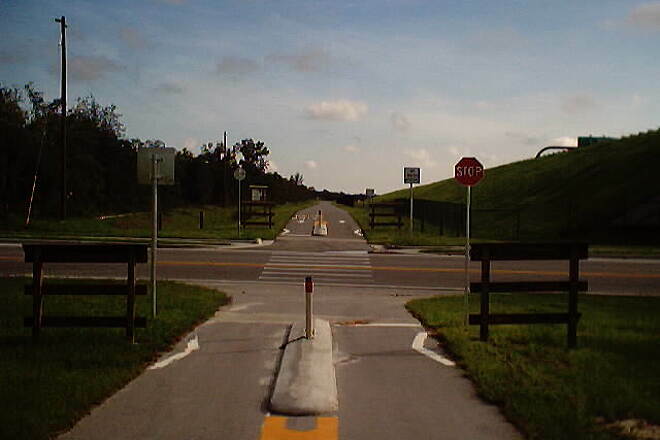 Trailhead at SR 54 (2.45 miles from southern terminus): From I-75, take Exit 58 to SR 54. 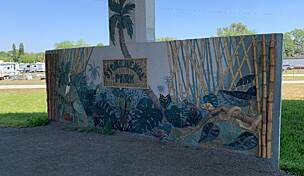 Head east (toward New Port Richey/Land O' Lakes) on SR 54 until you pass under the Suncoast Parkway. Trailhead entrance is on the right about 1 mile beyond overpass. 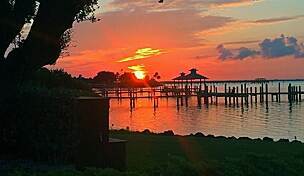 From New Port Richey, head east on State Road 54. 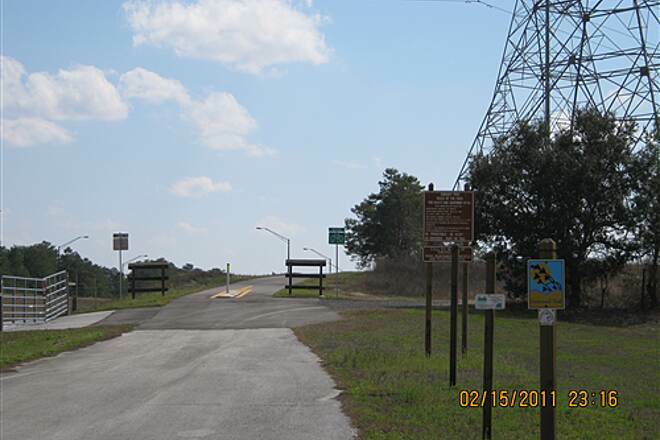 Look for trailhead entrance on left about 1 mile before passing under Suncoast Parkway. 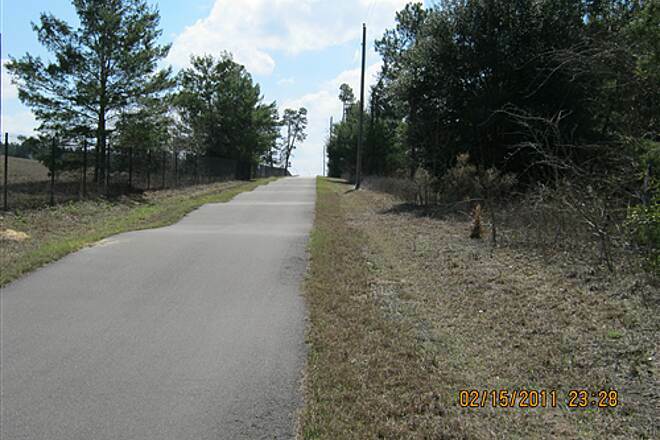 Trailhead at Crews Lake Park (15.86 miles from southern terminus): From I-75, take Exit 59 (new Exit 285) to SR 52. Head east on SR 52 (away from San Antonio) until you reach Shady Hills Road. Turn right on Shady Hills Road and proceed north until you reach Leeway Road. 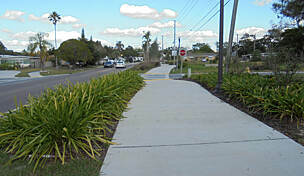 The Suncoast Trail can be accessed via a trail within the park. 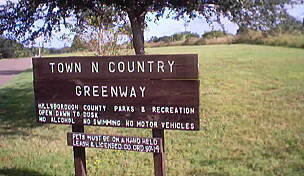 Trailhead at Anderson Snow Regional Park/Sports Complex (22.45 miles from southern terminus): From Brooksville, take US 41 south to County Line Road. 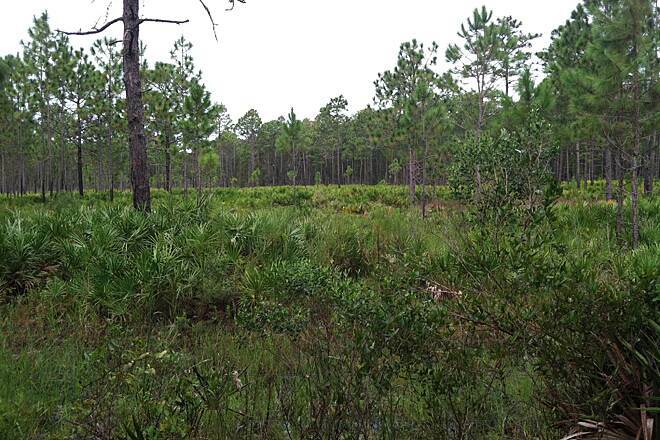 Take a right (heading west) on County Line Road and proceed until you pass the Suncoast Parkway. Anderson Snow Road is just past the parkway on right. Take Anderson Snow Road to the park. 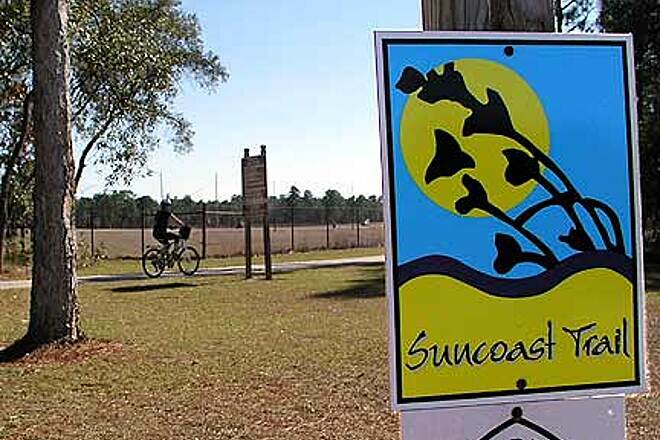 The Suncoast Trail can be accessed from within the park. 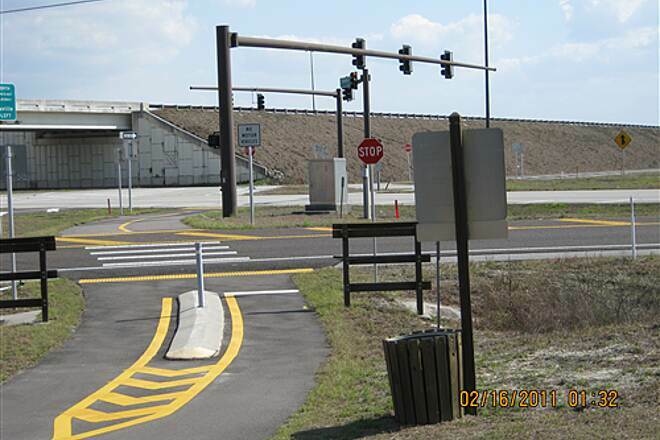 Trailhead at SR 50 (29.6 miles from southern terminus): From I-75, take Exit 61 (new Exit 301) to US 98/SR 50. Head west toward Brooksville. 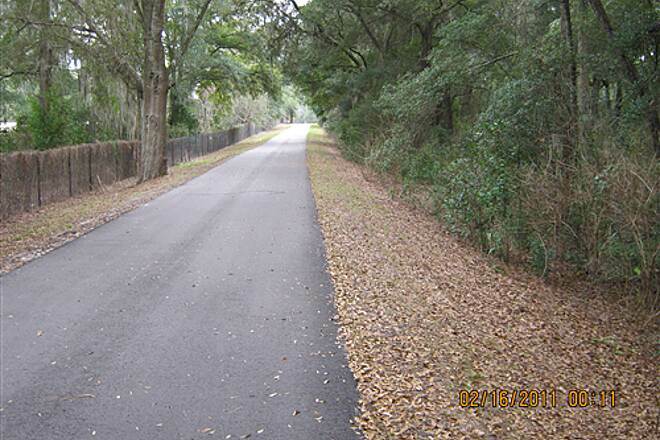 Continue through Brooksville on SR 50 and proceed until you reach the Suncoast Parkway. Look for the trailhead just past the parkway, south of SR 50 (on your left). Note: Parking fees do apply at some areas. First time on this trail with my wife. Generally run 30-40 miles at a time on our Bents. Parked at the northern end which has a $3.00 self pay station. Seemed pretty safe with the highway traffic going by, more of a chance people will see and report incidents? Started out hilly and not much to view paralleling the highway, very hot so we turned around after five miles. No water stops up to that point or at trail head. A composting toilet would be a great thought for the trail head. (had to drive 5 miles to a grocery store for facilities) Decided to follow the trail from the highway and survey the sites. State Road 50 trail head had a great restroom facility but parking lot was secluded which made me nervous to park my vehicle there. The trail followed the highway the majority of the distance with what looked like little to no shade for most of the way. I would recommend this trail to those that are training for races but not for the casual biking trip. Definitely carry water on this trail and spare tube for emergency purposes. There are other trails that are more family/casual rider friendly. Went down last week to ride 6 trails in area. This was the only disappointing one. Was surprised to pay $3 to park but at Hi 50 there was no info or mileage about the trail. The over pass of highway 50 is impressive but you are riding beside the expressway in the open all the way. There are no highlights and it is just a hilly ride. Biked this trail from the Rt 50/98 Trailhead on a Sunday morning. Signage was available in locating the trailhead which was helpful. The building had restrooms available, however, there lacked much information regarding the trail itself. No maps, no idea of mileage points at this trailhead to determine # of miles to the north or south, elevation and so forth. Biked on the southern end from the trailhead which was a little hilly in spots then crossing a 4 lane highway could be hairy. 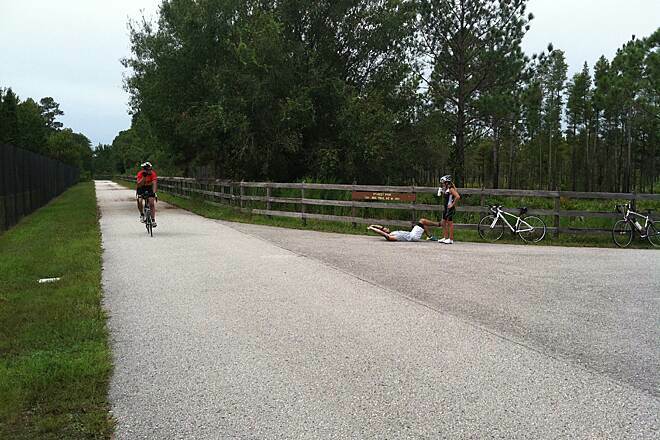 I am from Pa biking the Pine Creek Rail Trail where the grade is 2% so the Suncoast Trail did give me a workout. I enjoyed the path itself for riding and the availability of shade here and there. I'm not likely to go back only because of the hilly terrain for me. Great trail for training to bike long bike trips. I'm always looking for food on this trail. I found a great smoothie and wrap place on trail. It is juicy's juice bar. It is right off the trail on Powell. Beautiful and relaxing, currently missing it! 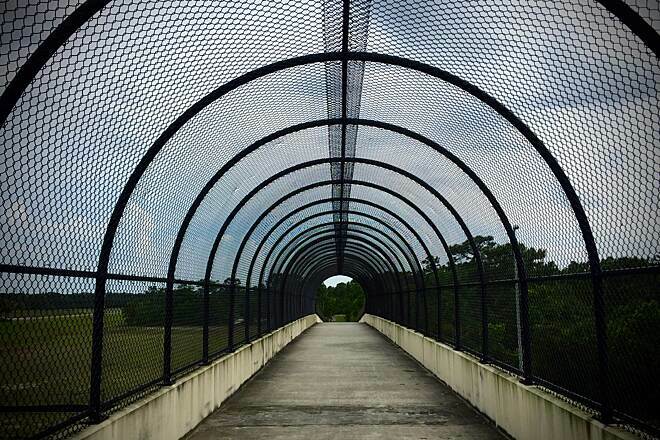 I just scored a new bike in Fort Lauderdale and figured I'd post how much I loved riding this trail when I lived in Tampa! Scenic, a decent bit of shade on some of the upper sections, wide enough for multi-use function, and you might even see a couple of horses on your route. We need something like this on the east coast! Besides running alongside the expressway, I really couldn't ask for more in a trail. There's enough straightaway and curve variation to keep it interesting, and the water coolers along the way have saved my bacon many times. 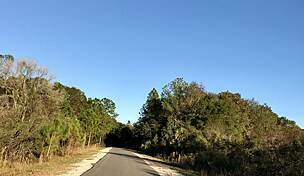 While traveling Florida in our RV, we parked at Chasshowitzka River campground (really nice), and I would ride over (about 5.5 miles) to the Suncoast parkway and have a great ride. I only rode the northern part which is supposed to be hillier, but I wouldn't call them hills - more like gentle rises. Even though this is next to the toll road it is very pretty, and you hardly notice the road is there. I enjoyed this very much. I rode it at the beginning of February, 2016. Virtually no shade so radiant heat from asphalt plus sun makes this trail best for AM rides. Constant traffic noise so despite pretty terrain to the west, no sounds of nature can be heard. Plus for $3 parking at trailhead I expect a toilet & drinking water but it has neither. On the plus side almost no on uses it during the week. Wonder why? started at trailhead just off hwy 54. This trail is well kept with some shade. The ride back to my starting point was with a head wind for 20 miles. Overall I enjoyed this trail and the scenery. All in all, a wonderful cycling experience. I went back to the Suncoast Trail last Sunday for the second time. To my delight, the southernmost end of the trail has been moved to about two miles west of its previous location. In about a year, much has been improved, the new location has bathroom facilities, ample parking and even a gazebo with benches and tables; still the parking fee is $2.00. The end of the trail, 43 miles north, remains the same undeveloped and exposed to the elements parking lot. The 86-mile round trip could be challenging. Don't ignore the warning signs about limited water availability. I ride this trail two or three times a week for the last 7 years, starting either at the west end of the Starky Trail or at the trailhead just off hwy 54. I generally ride 40 to 50 miles round trip but sometimes go further. The Suncoast is well suited for those who like to ride hard and fast, with few blind turns and lots of long straights. 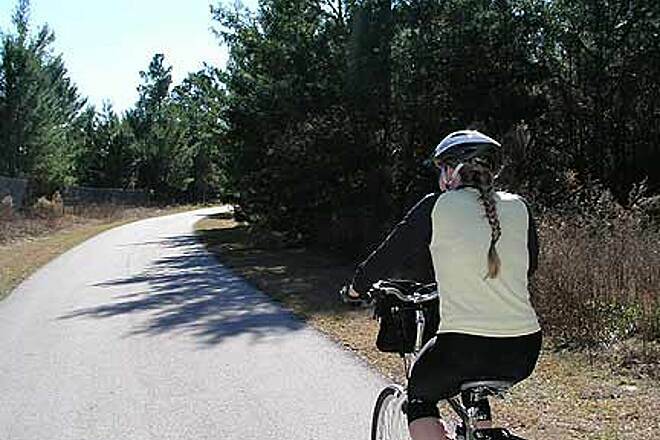 The people who ride the Suncoast, both the ones I pass and the ones who pass me, are generally polite and friendly and I very seldom see the flocks of slow movers that block the trail that I see on some other local trails. The trail is well maintained but the increased traffic the last few years has rendered the water stops unreliable so I've had to start carrying more water. There are reliable water stops, running water and flush toilets, at Anderson-Snow park and at the hwy 50 crossing. The northern 12 miles offers a little hill climbing fun, but there is no water available anywhere north of hwy 50 so carry enough liquids for the round trip of about 25 miles. I live in Wisconsin, and knew this trail was near where we were staying, so I brought my bike. So glad I did, because I was on this trail frequently during our trip and logged 100+ miles during that week. The entire trail is paved, which would allow for road bike use (brought my hybrid). This trail follows the tollway, but there are some scenic sections as well. There are some long stretches between road crossings, which is ideal for those who want to focus on training/speed. 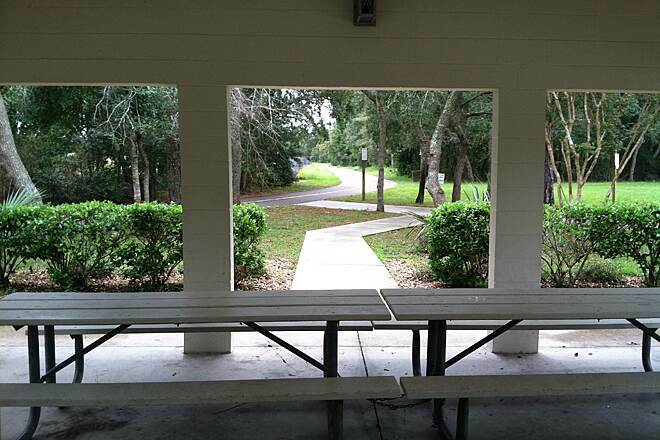 Scattered throughout the trail are picnic tables and benches in the event you want to rest for a bit. Beware that some intersections have heavy traffic, and the north section has more rolling hills than the rest of the trail. It is crucial to prepare for your ride, using sunblock (brought mine with me to reapply--Wisconsin girl here), gel packs/food, and HYDRATION. A standard bottle of water would not be enough in my opinion, so I used my Camelbak. Some sections have access to food/water, others do not for several miles, so plan accordingly. I will definitely be riding this again next time we visit Florida! I've been riding this trail for the past couple of months in training for a ride coming up in July. It's a great trail with a few flaws. While there are certainly limited crossings. 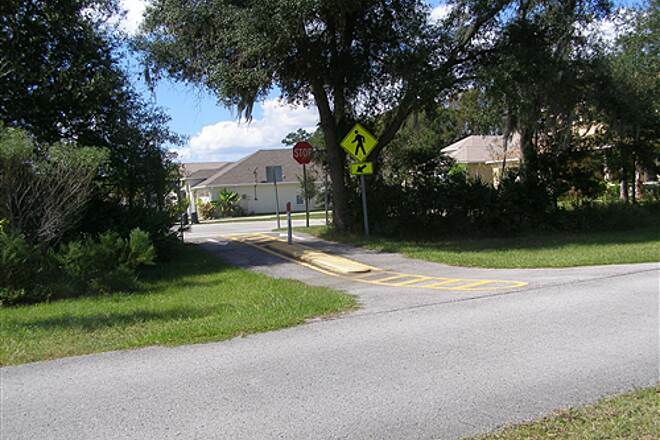 Coming from someone who used to ride the Pinellas trail, it's a godsend. Many of the crossings can be quite dangerous with 6 lanes going both ways in multiple locations so it's important to be alert. It can be quite scenic, but the biggest grief I have with the trail is the wind, which I understand doesn't really have anything to do with the trail, but it seems that there's headwinds going in both directions. I've only been riding seriously for a little over a year so maybe it's just my beginner legs, but I feel that the crosswind can be quite irritating at long distances (I'm riding 60+ miles solo usually) and it slows me down to a disheartening pace especially when heading south, which is the way back for me. 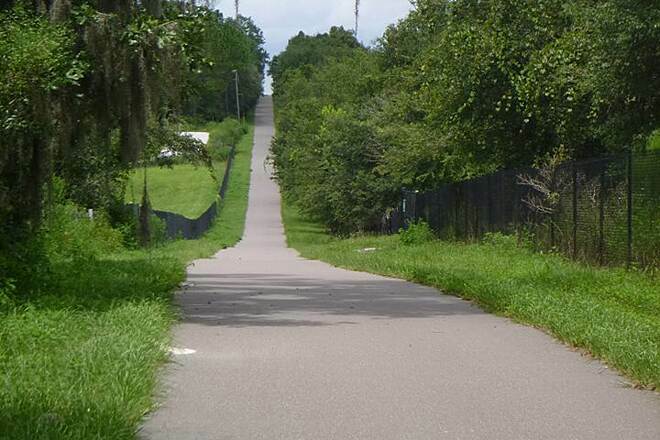 All in all, it's good to train under these conditions and the surprising number of hills on the north end is a welcome change to the typically flat Florida scenery. Long story short, I'd recommend riding in a group if you can find one. The best advice I can give is this: Arrive early or suffer the wrath of the unforgiving Florida sun and humidity. The heat is not as bad in the cooler months, but there's still very little coverage. I usually arrive around 7:30-8:00 AM and leave around 12:00 PM, but by 11:00 AM the sun is especially brutal. Wear sunscreen or you'll get burned up quick, and drink the provided water or you'll get dehydrated just as quickly. 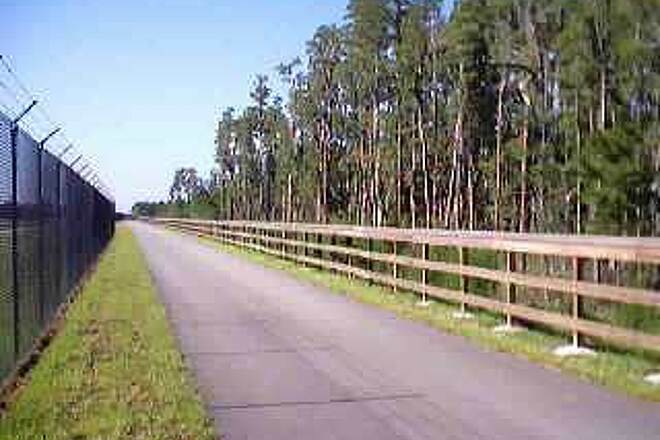 I drive all the way from St. Petersburg to ride this trail, so it's on the expensive side with the Toll road + $2 parking, but I wouldn't keep coming back if it didn't provide everything that I require. This trail seems to chew me up and spit me out on a weekly basis, but I always come back for more! Flat, straight, hardly an intersection, and the trail parallels a noisy highway. Ideal for heads-down time-trialing, with pavement marked every half mile, otherwise not among our favorites. Plan to be self-supporting (water, food, basic repairs). 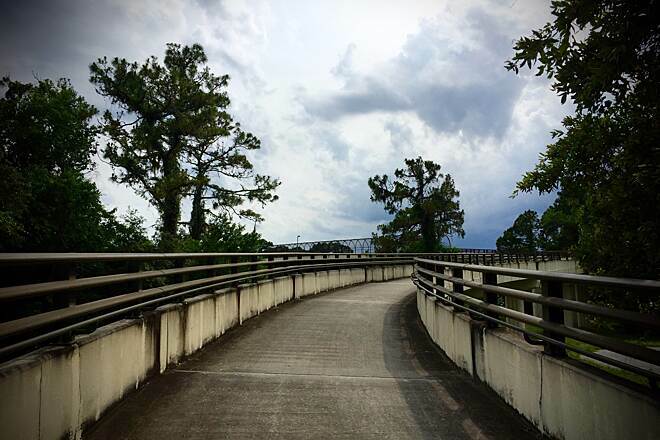 In late March 2015, the southernmost trail head and parking area was under construction, so take the highway north to next exit where you can find a good parking area for a $2 donation. This is an ideal more remote trail for more serious longer rides that are less interrupted by road crossings and families. I especially like it on weekends, when the Pinellas and Starkey Trails can be more congested with slower and less-experienced riders. That said, this is not ideal for families, children, and less experienced riders. As always, carry basic tools and stuff to fix flats. I resisted this trail for several years because it runs right alongside a major highway. What a mistake! 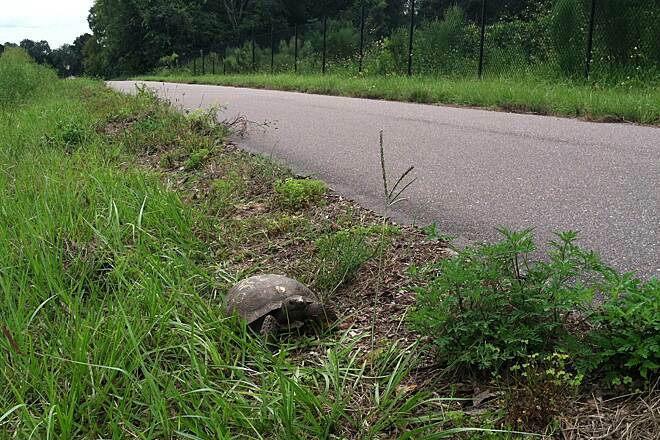 I'm hardly aware of the highway, and I've seen as much wildlife on this trail as anywhere---gators, deer, etc. Just enjoy the west side and ignore the east side. 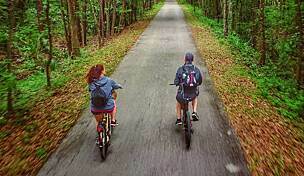 The plan to make this trail part of the Cross-Florida Trail and connect it with the Upper Tampa Bay, Pinellas, and Withlacoochee Trails is very exciting. 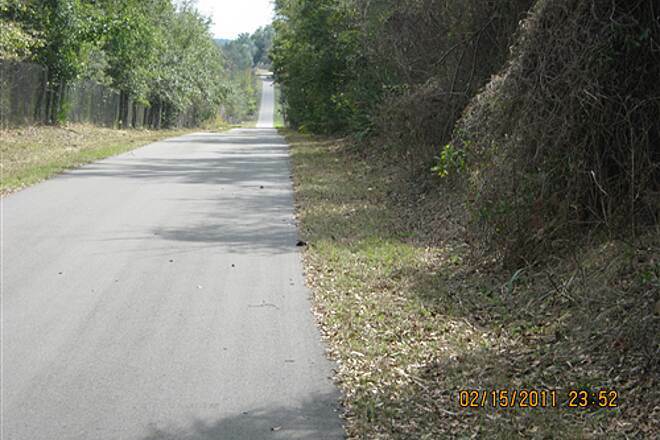 Well maintained trail with long distances between road crossings. Makes it very it very easy to crank away the miles with no worry about cars. Water stops along the way are very nice. 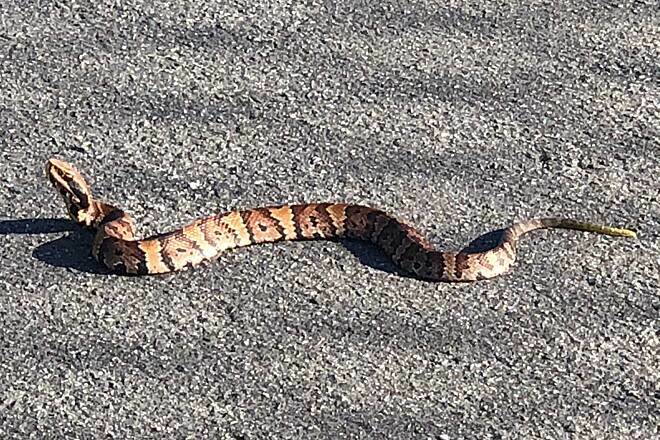 If you take the connector into the Jay B Starkey Wilderness Preserve it's a little more interesting. The weather was perfect in January - I'm thinking summer would be very hot. Wonderful trail, easy to find and easy to ride. The Rangers are very pleasant, nice and knowledgeable. Will ride again when I go back to visit the Tampa area. 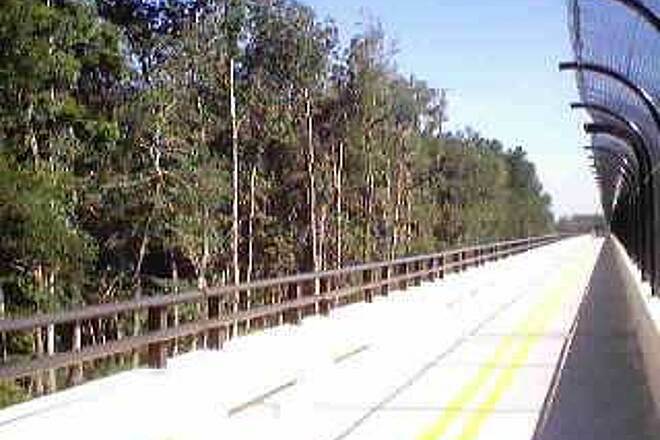 Well maintained trail with long distances between road crossings. Makes it very it very easy to crank away the miles with no worry about cars. I rode this trail several times and enjoyed it very much. I get on near Land O Lakes. There's a small bike shop near the Target that is great for last minute needs. You can even leave it over night for any maintenance, pick it up the next day and jump right on the trail. 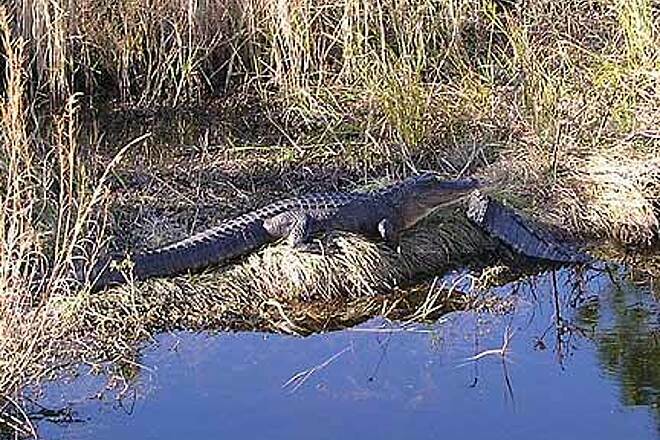 Being in Florida you really have to time it right especially if your going to be on it for the long haul. There are several stretches with little to no shading, making it a very long and hot ride. Sunscreen, shades and a helmet with a visor is highly recommended. Early morning or evening is the best time to ride. High noon can be brutal. Also, the trail is in a wind tunnel and it seems you're riding into it both ways adding resistance to your ride. 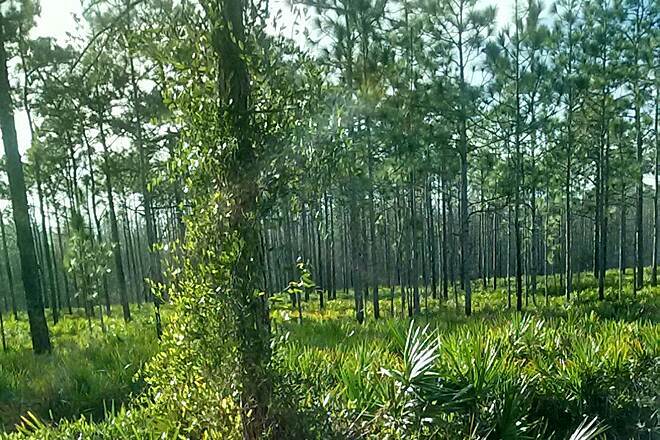 It's very scenic, passing through that natural Florida flora as well as farms and some suburban points. 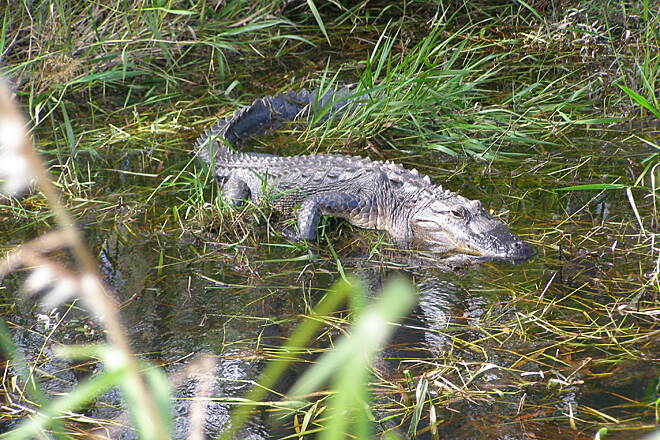 I always seem some sort of wild life, usually various birds, gopher tortoises and sunning alligators on occasion. 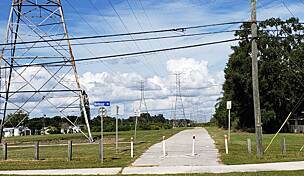 However, much of the trail parallels the Suncoast Highway. There are plenty of water points but I recommend bringing in as much of your own water as possible since the coolers are sometimes empty. Around the 15 mile mark is Snowden Park which has bathrooms and water fountains. At the 21 mile mark there is an elementary school just off the trail. If you are thirsty enough, there is a water fountain outside of the school. Around the 23 mile mark there is a small shopping center containing a tap house. :-) It's nice to stop in for a quick glass or two along the way. I've met other cyclist in that place. There are also a few full service restaurants as well. 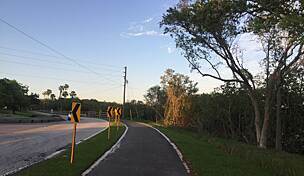 I've ridden the Suncoast several times now including a full ride from the Lutz Lake Fern trail head to two miles short of the north end; due to the trail being blocked by a construction barrier. Running adjacent to the Veterans Parkway is not as bad as it would seem. The highway is there, but you are not always running right alongside. Someone put some thought into it and did as best as they could. Personally, I’m grateful that someone even thought to build the trail. There’s also seems to be a slight level of creativity in some of the design including some uncharacteristic sweepers and elevation, not to mention that north of Spring Hill the trail has some really steep grades. There seems to be decent water locations along the trail, but a good hydration pack is always a good idea because I found many coolers empty by mid-day. 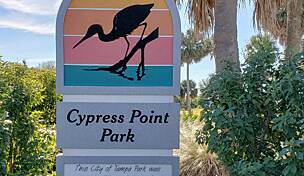 The best point for amenities is in Spring Hill, about 25 miles north of the Lutz Lake Fern Trail Head. 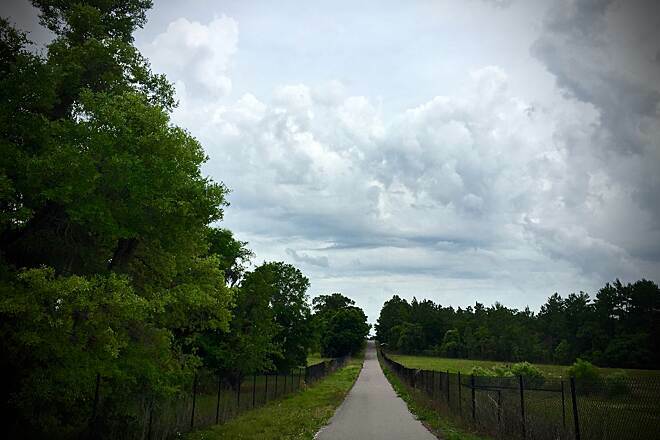 Lastly, I don’t think its well publicized that the Starkey Park Bicycle Trial connects directly to the Suncoast Trail and adds another 6.5 miles of trail to the Suncoast (13 miles in and out) and this trail runs completely clear of the highway. The Starkey doesn't seem to be mentioned in the description; nor is it on the map. 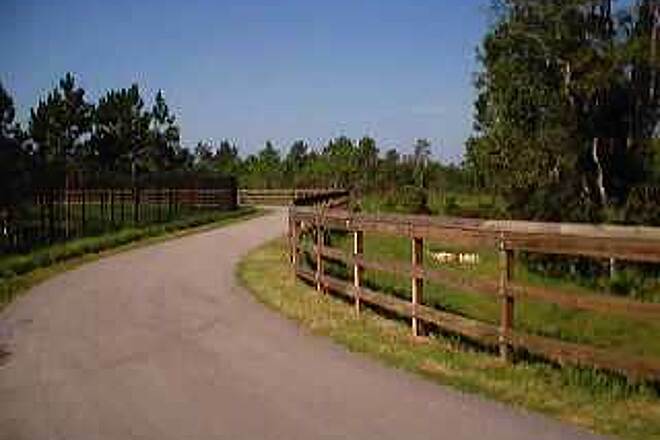 However, you can find the well-marked Starkey trail entrance at 6.7 miles north of the Lutz Lake Fern trail head (4.2 miles north of the SR52 Trail Head). The Starkey is all Florida ambiance. 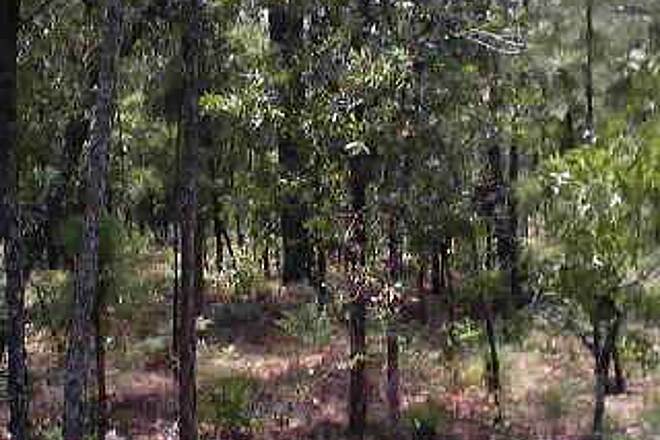 The Suncoast itself is a well maintained trail with lots of variants that are uncharacteristic of many other trails in the area. I recommend it highly. With a toll road paralleling this trail on the east side, the mornings and early afternoons will be in the sun for the most part. I found this trail well maintained and a pleasant ride. There are some long stretches between road crossing. The northern 12 miles from US 98 to SR 50 are the hilliest. 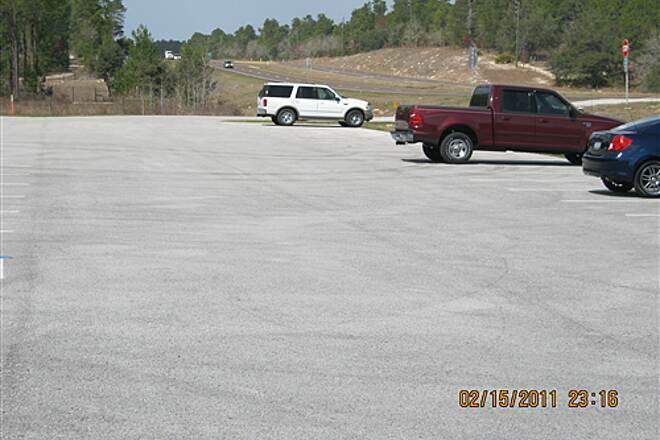 As of Feb 2013, Hernando County charges $3.00 a day for parking and Pasco County charges $2.00 a day. This trail was well maintained, and had plenty of benches and water. Would ride again. 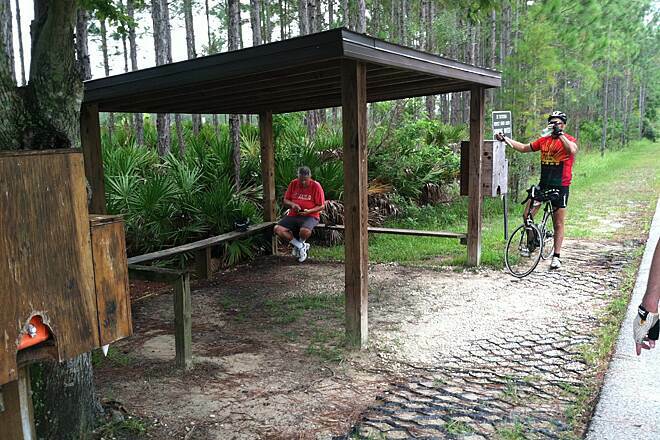 I started at the southern terminus in Lutz and went north about 10 miles. Mostly flat as is a lot of this section of Florida, paved everywhere I went. You have several opportunities to go "inland" away from the actual Parkway and get away from the traffic. As others have mentioned, limited amenities and water/restrooms. 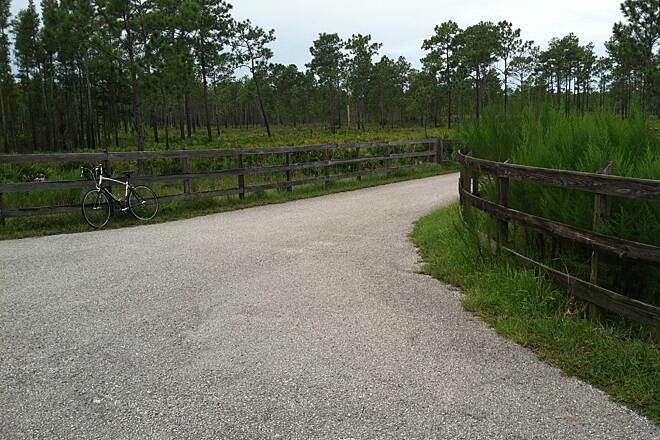 I am used to rail/trails in my home area of Pennsylvania so if you are on vacation in FL this would be a real treat. Rode this trail on April 26, 2011. 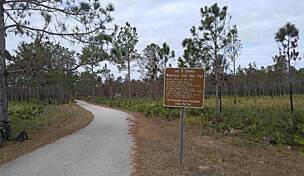 On a visit from CT, I found this trail challenging for a mid - Florida trail. Not flat like the van Fleet. There is a series of hills at the last 15 miles before the northern trailhead. Not long & steep hills like you'd find in CT, but downshifting was required. Water was limited, but available periodically. The bathroom facilities at Cortez were terrific, especially for a riding trail. 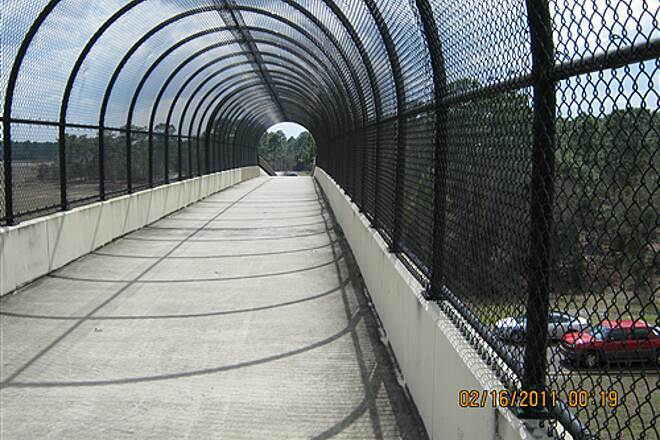 The pedestrian/bike bridge over Route 50 near Cortez was a nice touch. Some of the other road crossings are pretty risky affairs. Riding at mid day, I only saw a couple of other riders. As evening approached, more riders, walkers, and rollerbladers appeared. The northern trailhead was very barren; 1 picnic table and a handful of signs. Lot's of parking there. I wasn't pleased with the parking fee imposed by the Hillsborough County for their 2 parking areas @ W Lutz Lake Fern Rd & the other one @ Route 54. It's $2 per car; their bathroom facilities consist of Port-a-Potties and they warn of break-ins of cars parked there. Seems odd since none of the other trailheads imposed parking fees and some had better bathrooms (like Cortez). I would suggest parking at one of the other trailheads. Trail has nice variety; limited amenities. I rode the northern half of this trail in mid February on a mostly sunny, warm day. It was way better than I expected considering it parallels the Sun Coast Parkway. I've ridden trails before that are close to freeways and the road noise makes it unpleasant but this trail had buffers between it & the road and in many cases wasn't that close or maybe there wasn't enough traffic for me to notice (went mid day). The northern third or so has quite a few hills and some curves and lots of pretty pine trees and sparse traffic. The northern Trail Head was nothing more than a parking lot--no shade, shelter, bathroom facilities, water, etc. So bring your own water, food and find your own place to relieve yourself. 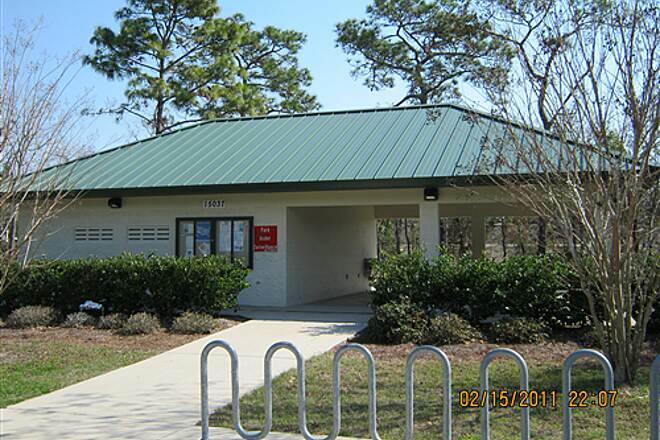 The Trail Head off of Cortez (Brooksville/Spring Hill) was very pleasant with a nice building, indoor bathrooms, cold water, shelter, picnic tables, etc. Also, there's a huge overpass crossing Cortez which was kinda fun in & of itself. My car was just fine when I returned. The southern portion had more traffic on the parkway and was closer to it but still wasn't that bad. There was also an athletic field/park with facilities, shade, etc. The condition of the trail was very good all the way. I will definitely finish the southern half on my next FL visit. 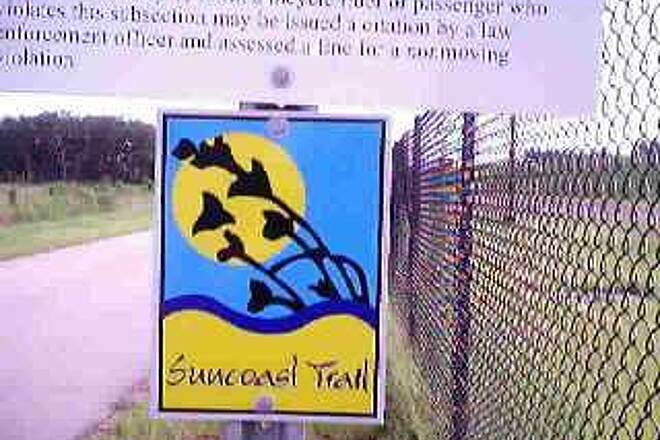 What is the hold up on the connections between the Suncoast and the UTB Trail? I mean, heck, we've only been waiting for this silly thing for the last 9 years, since it was proposed! OK, I realize that the "wheels of Bureacracy turn slowly," but this is ridiculous! Come ON, people... 9 years? My grandmother could have done it by herself, by now! And she's been confined to a wheelchair for 15 years!!! 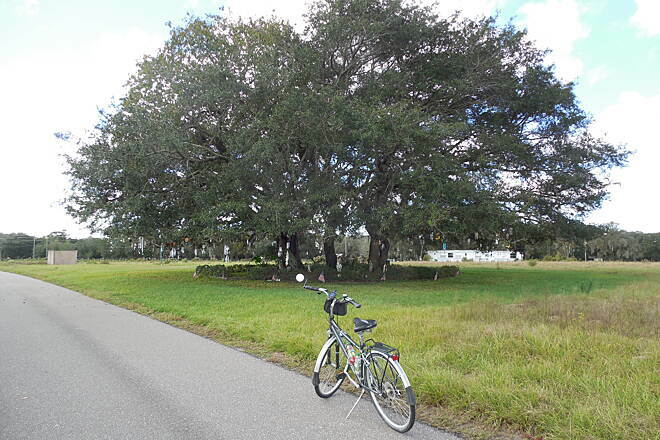 I cannot wait to ride my bike from Hillsborough Rd, in Tampa, aaaallll the way to Citrus County and beyond!! Wanted to access the trail at SR-52 but construction seems to have obliterated the access point.Entered at SR-54 and went north. Nice level trail.Scenery leaves something to be desired in this area.Nice ride none the less. "I'd like to begin as far north as possible. What motel might anyone recommend at the north end, and (perhaps) at the south end?" "This trail is a boon! I especially like the section between County Line Road and US-98. This section has some nice hills and plenty of foliage. 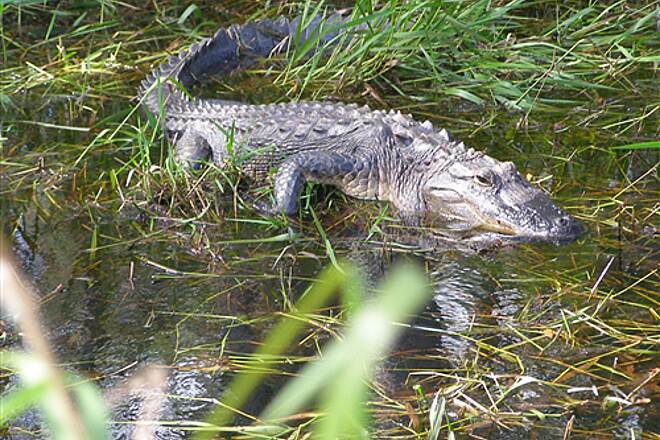 The Suncoast Trail does need more restroom facilities, IMHO. 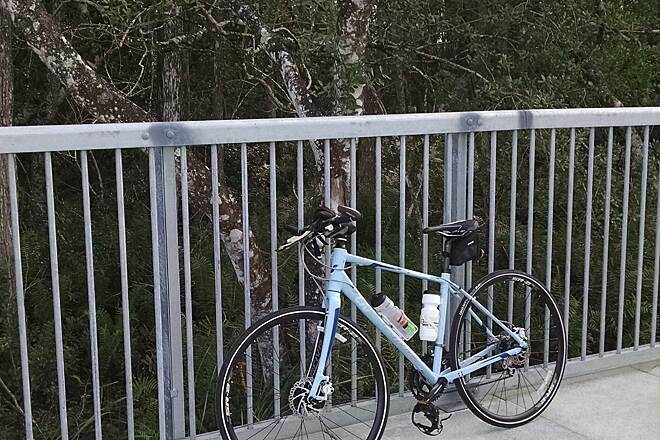 I can hardly wait until the Suncoast Trail becomes connected to the other local trails. We need to escape the cars!" 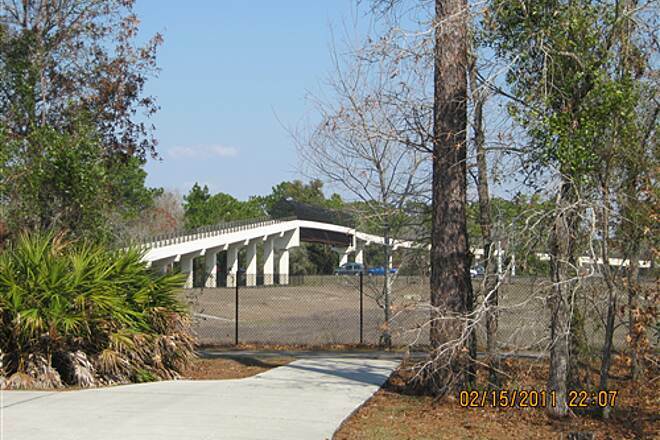 "Phase II of the Suncoast Trail is now open, from SR Hwy 50 north to US 98. 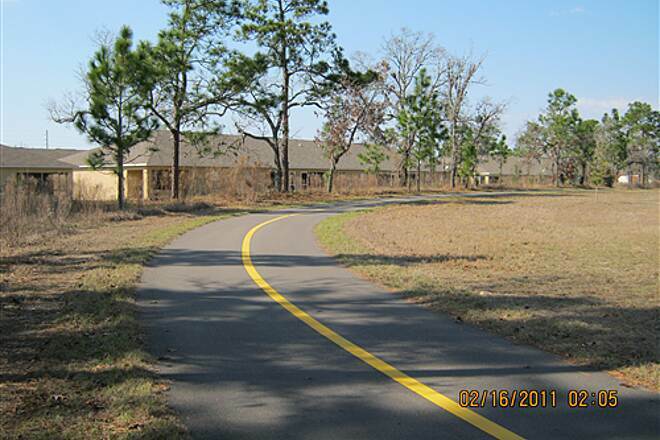 The trail dedication ceremony will be at 10:00 a.m. on April 26, 2003, at the SR Hwy 50 trailhead. 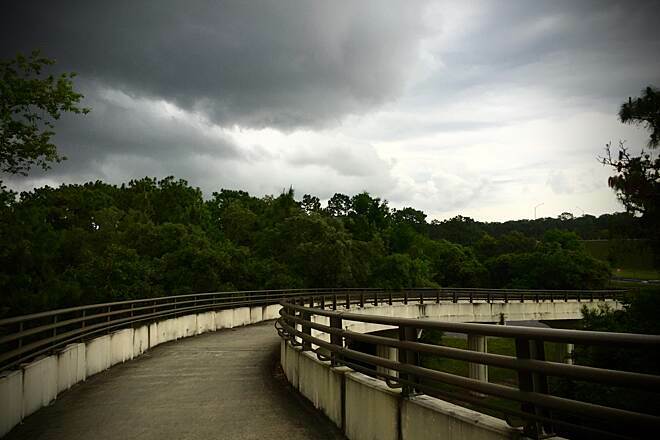 "My 19-year-old son and I did this trail on a chilly weekday, and we found it exhilarating. The natural feel of the woods on one side is unfortunately offset by the rush of cars on the other side, but the ride was easy and comfortable. We say no one else on the trail, but there may be more trail traffic on the weekends." 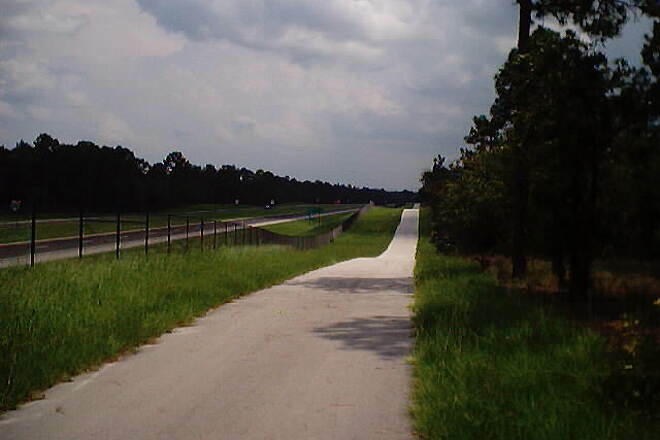 "THIS NEARLY 30 MILE RIDE IS PAVED FROM LUTZ LAKE FERN ROAD NEAR THE SUNCOAST PARKWAY IN BETWEEN CR. 587 GUNN HWY AND SR. 597 DALE MABRY HWY TO SR.50 CORTEZ BLVD/SUNCOAST PKWY IN BETWEEN US 19 AND ABOUT 15 TO 20 MILES WEST OF INTERSTATE-75. IN THE NEAR FUTURE, THIS TRAIL IS PROJECTING THE UPPER TAMPA BAY TRAIL TO INTERSECT THE SOUTHERN TERMINAL OF SUNCOAST TRAIL WHICH TAKES YOU TO SR.580 HILLSBOROUGH AVE TO TOWN N COUNTRY/OLSMAR AREA.WE ALSO HAVE A PROJECTED ROUTE BETWEEN SR.54 AND SR.52 THE STARKY WILDERNESS TRAIL.THIS TRAIL TAKES YOU THROUGH SOME BEAUTIFUL SCENERY TO PINELLAS/PASCO COUNTY REGION.IN ADDITION WE ALSO ARE PLANNING FOR THE GOOD NEIGHBOR TRAIL GOING TO THE NORTHEAST TO THE WITHLACOOCHIE STATE TRAIL WHICH LEADS TO FLORAL CITY,INVERNESS,CITRUS SPRINGS,TRILBY,AND THE OCALA OUTSKIRTS.PLUS WE BELIEVE THE PINELLAS TRAIL COMING FROM ST. PETERSBURG WILL EITHER TAG ALONG WITH THE STARKY TRAIL OR POSSIBLY WITH ITS OWN PATH. I BELIEVE IF IT DID IT WILL INTERSECT IN BETWEEN SR. 54 AND SR.52. WE ALSO HAVE ANOTHER PROJECTION WHICH IS ACKNOWLEDGED ALREADY TO US 98 WHICH IS A EXTRA 10 PLUS MILES.THEY ARE ALSO PROJECTING FARTHER PROJECTIONS NORTHWARD TO CITRUS COUNTY.IT GETS BETTER. 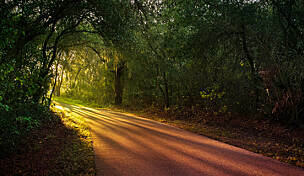 JUST A LITTLE WAYS THE NATURE COAST TRAIL WHICH RUNS 30 PLUS MILES NEAR THE FANNING SPRINGS TRENTON AREA NOT TOO FAR FROM GAINESVILLE. 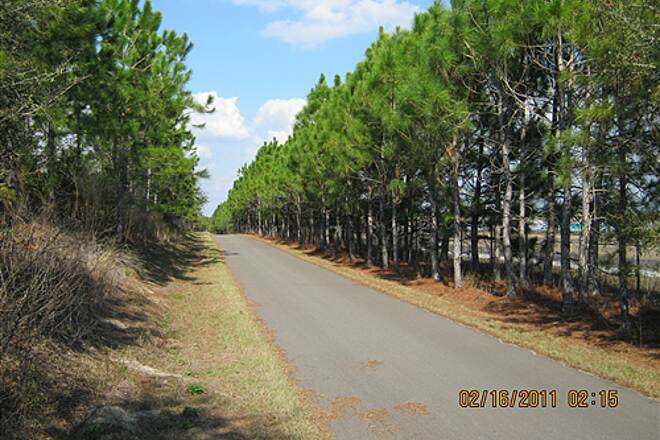 WE ALSO HAVE A PROJECTION RUNNING A PARALLEL APEX TO THE WITLACOOCHIE STATE TRAIL IN CITRUS COUNTY.I HOPE THIS INFORMATION IS GOOD ENOUGH FOR YOU ALL WHO LOVE BIKE TRAILS JUST LIKE MYSELF. HOPE TO GIVE MORE INFORMATION AS SOON AS POSSIBLE. THANKS CHRIS"